Now that we understand how to take advantage of cheating from a defense we will talk about how to run the ball. Generally when running you want to attack open gaps in the defense. What are open gaps? Gaps are the spaces in between lineman. The defense will have linemen in some of the gaps and others will be left undefended, this is where you want to run. What happens when defense plays head up techniques? 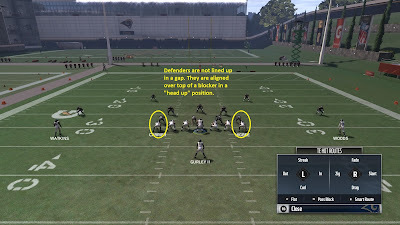 The way I attack head up defenders is by looking at the offensive lineman as what gap they are they responsible for. 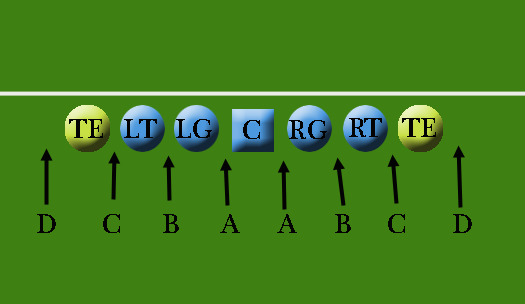 I look at the center as the "A gap blocker" the Guards = "B gap blocker, Tackles = C gap blockers, and TE/Wings = D gap blockers. Now all you have to do is see which of the linemen don't have a defender over the top of them. 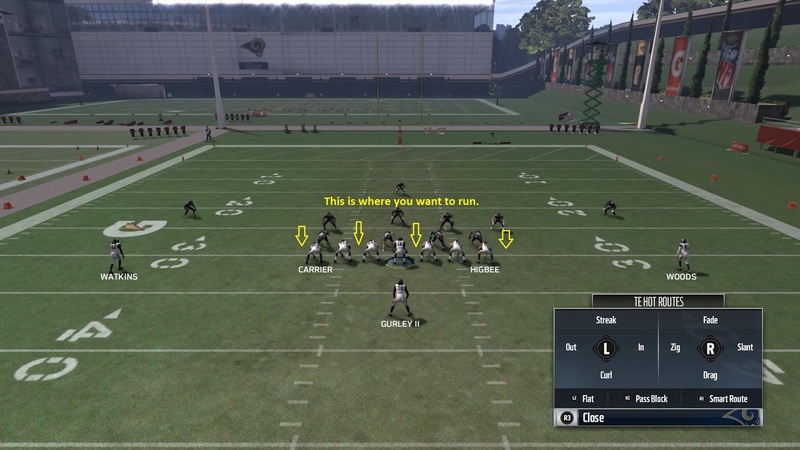 You then pick a run play that attacks that gap. In the above picture you can see that the B gap on the left side is open. So, what you can do is choose a play that attacks the B gap. If you pick a B gap run to the right and it has a player in it like the above diagram then all you have to do if flip the play to the other side where the gap is open. Note: To find the what gaps the play hit look at the on field pre-play diagram. The playcall screen diagrams do not always match-up once you get on the field. The reason you want to run to these open gaps is because you generally want to get your runner downhill and past the line of the scrimmage as fast as possible. By having leverage toward the gap you are running to, linemen should have better angles to block because they are closer to where the ball is going. Ideally you don't want your runner to make a cut during the play. The best cut is no cut. This allows your runner to get downhill past the line of scrimmage as fast as possible. If there was a defensive lineman in the gap his presence would usually make the runner have to bounce or cut back away from the initial gap that the runner was intended to go through. The reason this is a problem is when bouncing it out or cutting back that is more time the runner is spending on getting up-field. This allows defensive pursuit and block shedding to catch up to the ball carrier. To recap the main thing you want is your runner getting downhill past the line of scrimmage as fast as possible. This gets yardage quicker and limits the time the defense has for pursuit. You do that by running to the open gaps. This helps your offensive line block because you are running to an area where they out leverage the defensive line. On the next blog we will talk about a what the defense can do about this. For more information on running to gaps see here.